This newer business model has three huge advantages that are driving enormous shareholder gains. Here's everything you should know. Back in 2000, if you were filing your taxes with Intuit's TurboTax, you would buy its software on a compact disc, download the software onto your computer, and input your data into the program. With changes to the tax code every year, you had to cycle through the process annually. The advent of cloud computing has changed all of that. These days, you can use TurboTax software without downloading anything, updates to the company's systems are made in real time, and all of your data is stored for you on Intuit's servers. This is an example of software-as-a-service -- or SaaS. The model has transformed the relationship between a customer and a company's software: where once owning the software on site was key, it is now the ability to access the software that truly matters. As more companies, both new entrants and existing software providers, gravitate toward the SaaS model, it's also becoming an increasingly popular area of focus for investors. Below, we'll dive into SaaS and discuss why it's so advantageous -- to companies, to their customers, and to their investors. We'll also tackle the unique metrics that will help you measure the strength of an SaaS company's business and discuss the risks any potential investors ought to be aware of. What is software-as-a-service or SaaS? Perhaps the best way to start is to define software. Put simply, it is any program that can be run on a computer. That online calculator, the Word document you're working on, and the weather app you check daily are all examples of software. In order for those to work, someone had to create the computer code to make them function. If that still seems fuzzy, think of it this way: software is usually juxtaposed against hardware. Hardware is the physical computer or smartphone that you own. You can hold hardware in your hands. Software includes all the programs or apps that you use on a device -- no physical product to speak of. Software-as-a-Service (SaaS) companies have taken advantage of cloud computing in order to provide access to software and stored data from any device with an Internet connection. Cloud computing, which makes SaaS possible, is the practice of using offsite servers to house and handle large computing tasks and making all of the relevant information available on demand via the internet. SaaS companies host their software and data in the cloud rather than worrying about supporting the hardware and infrastructure of large server centers. Companies can now make upgrades to the software instantaneously, across the entire system, at virtually no cost and with minimal disruption for a consumer. This is much more efficient than in the past, when a new version of software had to be physically downloaded on each device that wanted to use it, whether it was distributed via online download licenses or CDs. In exchange for a monthly or annual subscription fee, a customer can access the company's software and their relevant data at any time from any viable internet connection. In some cases, customers can customize the software to meet specific needs or pay for different levels of software features, something that was very difficult to do before cloud computing became commonplace. There are three main advantages to the SaaS arrangement. First, software companies can now keep their focus on the software they're creating. They're no longer required to run and maintain extensive hardware systems required to support licensing servers, and they no longer have to manufacture or ship goods of any kind. Previously, for licensing software downloads, a company would need to account for regular hardware purchases and expenses for the upkeep of an in-house data center including real estate, electricity, and personnel to manage the systems. Prior to that, a company would manufacture millions of copies of its software -- for example, Microsoft's Windows operating system -- on compact discs. It would then need to safeguard those CDs and pay for shipping to resellers while facing a slower production process and lower margins on the software it was selling. Second, the business models have transitioned from large one-time payments that occurred on an infrequent basis to a subscription-based model. While the smaller fees associated with monthly subscriptions might seem meager compared to large single purchases, they quickly add up. Think about it from the SaaS company's perspective: it might be difficult to get people to fork over $100 for a software license, but it's much easier to get them to pay $10 per month for access to that software -- and at the end of the year, you've gotten 20% more revenue ($120 versus $100). This creates steady revenue streams for the software company that make it easier for investors to evaluate how well a company is doing. Reliable revenue also makes it easier for a company's management to make its own investment decisions, for example, whether to pour money into growth opportunities or capital expenditures. But by far the biggest advantage of the SaaS model is that it provides a wider economic moat, or sustainable competitive advantage, by creating high switching costs. Switching costs can range from actual monetary costs a customer faces to move away from a particular product, service, or provider to the time spent or aggravation caused by needing to implement such a change. SaaS models create high switching costs of both varieties. When a consumer or a company uses a software solution for important tasks, that solution becomes ingrained in daily workflows. And because the software can be updated instantaneously at no cost, there's little chance of the competition introducing a game-changing new feature that can't be mimicked in short order. With these dynamics in place, a customer moving to a different software provider becomes onerous not only in terms of paying to transfer all of your data from one solution to another but also in terms of the headaches caused by retraining an entire workforce on a brand new system. Consider Axon Enterprises (NASDAQ: AAXN), which offers Evidence.com as an SaaS for police departments to store, analyze, and use footage from body cameras. If a department wanted to switch to a different cloud provider, it would not only have to pay someone to migrate all of that data, but it would have to retrain its entire workforce on a new system and risk losing mission-critical legal data in the process. That's a significant amount of incentive to stay with the software company they know. The journey of Adobe Systems (NASDAQ:ADBE) highlights the pitfalls and opportunities that this new business model presents. For most of its corporate history, Adobe made software that allowed creatively inclined professionals to make, edit, and design their graphics, photos, illustrations, and other projects. Unsurprisingly, this software was usually sold as a very expensive (more than $500) licensed download or CD that could be installed on only one device. When the SaaS movement began in earnest, Adobe was slow to transition, and shareholders paid a heavy price. Not only were consumers wary about putting down so much money during the Great Recession, but they didn't like the amount of memory the applications took up on their computers or the fact that they could only use them on a single device. Sales plummeted, and as the economy began to recover, Adobe was left in the dust. ADBE Total Return Price data by YCharts. The company eventually realized the error of its ways and announced it would be moving toward a more affordable, cloud-based way of delivering its solutions. That transition didn't take place overnight, and because subscription-based revenue takes time to accrue, sales gains were realized slowly. But eventually, it became very clear that the company was on to something. Subscription revenue has boomed -- reaching $6.1 billion and accounting for 84% of all sales in 2017. Just as important, annual recurring revenue -- the kind that is very predictable -- was $10.5 billion last year, up 31% from 2016. Transitioning to SaaS has been the company's savior. This stands as an important lesson: even if an established company is late to the game, it can transition to an SaaS model -- provided someone else hasn't already moved in an offered up a comparable solution. Why should you invest in SaaS stocks? Investors in SaaS companies have reaped huge benefits, and the widespread adoption of SaaS platforms across business and personal applications doesn't appear to be slowing down. A study from network solutions leader Cisco Systems found that SaaS has made up the majority of global cloud computing workloads since 2016 and estimates that it will account for 75% of it in 2021. In analyzing the trend, Cisco's Global Cloud Index explained: "As trust in adoption of SaaS or mission-critical applications builds over time with technology enablement in processing power, storage advancements, memory advancements, and networking advancements, we foresee the adoption of SaaS-type applications to accelerate." SaaS has managed to seize upon the opportunity created by new technology in cloud computing to deliver incentives for both software companies and customers. For companies, it delivers more reliable revenue streams that allow for building robust ecosystems customers don't want to leave while allowing for a smoother distribution and update process. Meanwhile, businesses and individuals get the all-inclusive solutions they crave for simplifying daily tasks, and a subscription fee covers their service and updates. 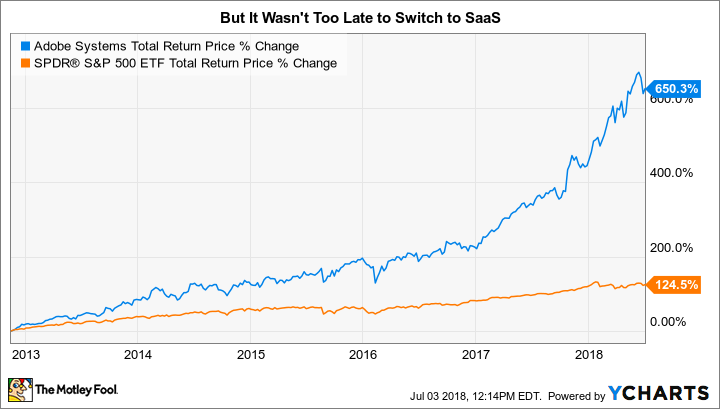 The PowerShares Dynamic Software ETF, which invests in SaaS companies, has more than doubled the S&P 500's returns over the past two-plus years. The intriguing prospect: this could just be the tip of the iceberg! According to market research firm International Data Corporation (IDC), sales for the SaaS industry stood at $67 billion in 2015. Over the course of just one year, it increased 27% to $85 billion. And the firm believes that by 2021, it will grow all the way to $200 billion. That's an annual growth rate of almost 19%. Put another way, IDC believes that by 2021, $1 out of every $3 spent on software will be in the form of SaaS subscriptions. While bigger companies like Adobe can benefit by pivoting from traditional software to SaaS, there are even bigger opportunities for disruptive upstarts creating new software solutions and grabbing business away from older software companies that aren't yet taking notice. 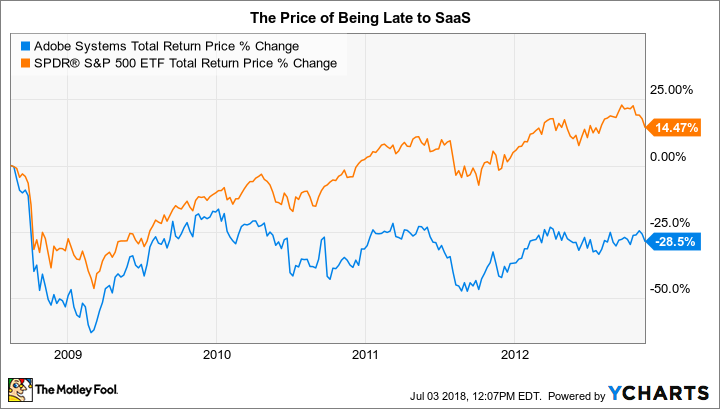 Because of their popularity over the past two years, many SaaS stocks are richly valued based on traditional metrics like price-to-earnings (P/E) or price-to-free-cash-flow (P/FCF) ratios. That means we need to use some specific metrics to measure how the company is faring. These can be particularly useful in evaluating the upstarts trying to disrupt the larger software companies. First, we'll deal with getting customers into a company's ecosystem. While being protected by high switching costs is great, it's a double-edged sword: SaaS companies usually have to fight hard to win new customers. Winning over converts isn't easy. Growth in total users: Measuring the growth of users is relatively easy. SaaS companies either publish these numbers in their press releases or mention them in their conference calls. When such growth is present, it shows the SaaS offering is superior to whatever else is available. Sometimes, when the company is sufficiently big, it will forgo such metrics in favor of ARR -- a measure of predictable cash flows. Customer acquisition costs: We also want to know that customer acquisition costs aren't onerous. If an SaaS company is adding lots of users, it makes sense that sales and marketing expenses will also increase. What's important is that these expenses grow at a slower rate than jumps in ARR. Annual recurring revenue (ARR): Why focus on ARR instead of revenue growth? Because of how revenue is recognized. If a salesperson gets a $1,000 bonus for signing on a client who will spend $12,000 over the next year, that's not a bad deal. But if it occurs one month before the end of a quarter, the revenue statement will only reflect one month's subscription -- or $1,000. On the surface, that looks like a pretty bad deal: the salesperson was paid $1,000 to bring in $1,000. Zeroing in on ARR gives a clearer picture; because that $1,000 is recurring, we can see that the sales money was well spent. ARR jumped from $7.98 billion in 2016 to $10.46 billion in 2017, for growth of 31%. At the same time, sales and marketing spending increased just 15%, meaning the cost of acquiring new customers -- or getting existing customers to use additional products -- is going down. Once customers are in a company's SaaS ecosystem, as investors, we should be concerned whether they are staying and, hopefully, adding new products along the way. Measuring retention can be a little trickier than assessing how well a company brings in customers. Some companies publish churn rates -- how many customers leave each year -- where higher numbers are bad. But it is not an industrywide practice to publish such numbers. Revenue retention rate (RRR) or dollar-based net expansion rate (DBNE): Both figures measure the same thing: they take all the money that existing customers spent in Year One and compare it to all the money the same group of customers spends in Year Two. By doing this, we wash out the effect that new customers have on revenue and combine the forces of churn (losing a customer) and cross-selling existing customers on new products. An RRR or DBNE of 100% is a good starting place, because it means that customers are generally staying with a company. What investors should really look for are figures above 100%, which means that not only are customers staying on board, but they are adding more products over time. Such figures are usually published on an annual basis and can be found in a company's annual report under the "Management's Discussion" portion of the document. For example, Twilio (NYSE: TWLO), a company that provides communication solutions on a subscription basis, reported that its DBNE for 2015, 2016, and 2017 has been 155%, 161%, and 128%, respectively. Those are very positive numbers and help explain why the stock is up 165% since January 2017. Investigating these metrics requires a little more homework on the investor's part, but it's well worth it. SaaS stocks have been providing superior returns for years now, and that extra effort you put forth can help secure your financial future. There are plenty of SaaS companies to invest in. Some of them are pure plays, meaning the SaaS represents all of the business, while some include SaaS as part of a broader approach. Below are three companies that have produced outstanding results over the last three years. Provides a platform for merchants to create an e-commerce presence. Allows companies to track all HR-related functions on a single interface. Helps companies track and manage relationships with their customers. Data source: YCharts, Invesco. Returns include dividends. Returns accurate as of Aug. 22, 2018. It's worth noting that over the same time frame, an investment in an S&P 500 ETF would have returned 46%. In other words, all three of these SaaS companies are long-term outperformers, with the average three-year return coming in at nearly 300% -- or more than six times what the broader market has returned. If a small or medium-sized business wants to set up shop these days, it can't do so without considering what its e-commerce strategy will be. Shopify helps do that by managing website hosting, social media campaigns, shipping, and payment options, all from a single, easy-to-use interface. The number of merchants using Shopify has exploded, from 175,000 in mid-2015 to more than 600,000 today. Looking at a three-year period dating back from the second quarter of 2018, revenue has grown by 440%, and monthly recurring revenue (a variation on ARR) grew by 315%. Shopify's revenue-retention rate has always stood above 100%, meaning that successful merchants were not only staying with the platform but spending more over time. Old-school payment processors like ADP and Paychex made their mark by streamlining the payroll process. Paycom decided to tackle that task with a twist: handle multiple human-resources-related functions, like health benefits, recruitment, and hiring all on an SaaS platform. The solution has resonated with companies, especially as they try to tackle all of their HR needs with a single application. Over the past three years, Paycom's number of clients has grown from 15,000 to almost 21,000. Recurring revenue has grown 165% from the second quarter of 2015 to the same period in 2018; and the revenue-retention rate has remained steady at 91%. While this might seem low, it's worth noting that Paycom focuses on small and medium-sized businesses. Not all of these businesses will succeed, through no fault of Paycom. When these companies close up shop, it affects revenue retention without indicating a weakness at Paycom. Zendesk offers tools that help companies chat in real time with customers, operate cloud-based call platforms, track previous interactions and issues that customers bring up, and analyze all the data collected. Like Shopify and Paycom, Zendesk has seen revenue climb steadily, and it even tripled in the last three years. The number of paid customer accounts has increased 72% to 118,900. Even more impressive, the dollar-based net expansion rate most recently came in at 119%, which shows that customers are not only staying with Zendesk but using more of the company's tools over time. As exciting as these investment opportunities may seem, there's also a fair level of risk involved. Technology and marketplace trends are pointing squarely toward continued growth for SaaS, so many companies in the field have very high valuations. As such, even the smallest sign of weakness or a slowdown in growth can cause their stocks to plummet. That's part and parcel of investing in high-growth industries. If you don't have the stomach for such wild swings -- and might be tempted to hit the "Sell" button when such drops occur -- investing in SaaS companies might not be for you. Furthermore, many smaller SaaS companies have yet to become profitable or are only just past the threshold. That's not without reason, as many of them are investing aggressively in order to capture long-term market share of those reliable-revenue streams. But if an economic crisis were to occur, those companies could be hit particularly hard if business growth decelerates markedly and the investments for further growth don't bear fruit. There's always the risk that larger software players -- those that existed long before the onset of SaaS and have troves of cash on hand -- could create services to rival those of smaller companies and offer them at lower introductory rates. While that would hurt larger players in the short term, they could raise prices after a few years, assuming they can take enough market share to force smaller competition to fold or to be acquired by others.